Hey guys, new coloring! This time I tried something a bit different. 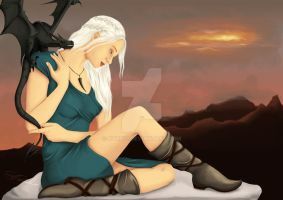 This time it's Daenerys Targaryen! Hope you guys enjoy it~ More to come later. I don't know if there is one, but if you want to start a game of thrones series of graphic novels or comics, I am behind you! That would be SO COOL! I'd color the heck out of it, lol. and you would do a fine job! Yeah, I noticed that too when I was coloring, haha! Would love it if you did a few more GoT ones. Maybe Jon Snow Up on the wall with blue flower petals? Love the work, even if the character isn't my fav. Thanks so much for the comment! I'll be on the lookout for some other GoT linework!